HOPPE has appointed Jonathan Walker as ARRONE product manager. 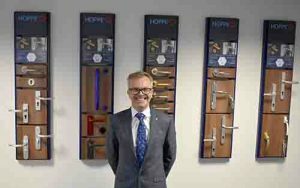 Jon has over 25 years’ experience in the door and window hardware industry, specialising in new product development and market research. He has previously worked for Paddock Fabrications and Yale, and joins HOPPE (UK) from Avantis International where he was group sales and marketing director. Jon says: “In the short time I’ve been with HOPPE, I’ve seen the wealth of experience and the volume of knowledge that the technical teams have; they are a real authority on what they do. I’m looking forward to tapping into this, and talking to customers to find out exactly what they want and need from ironmongery products to ensure that we tick all right boxes. 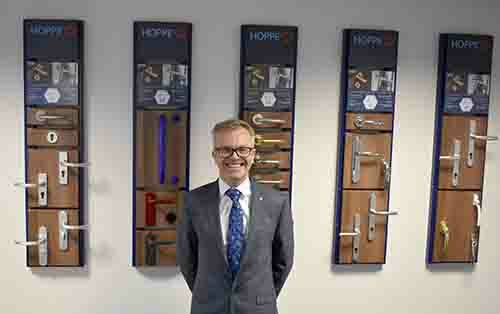 Based in Wolverhampton, HOPPE (UK) Ltd is a market leader in door and window hardware. As a member of HOPPE Group, HOPPE (UK) provides architectural hardware products that have been tested to meet the most stringent European and British standards.